People who live in Grewelthorpe are familiar with the name Nutwith. They know Nutwith Lane, Nutwith Common, Nutwith House, Nutwith Cote and Nutwith Wood. In 1843 a horse owned by Samuel Wrather. of Masham called “,Nutwith”,, won the St. Leger. It is interesting to find out where this name comes from. The word Nutwith means nut- wood. In mediaeval times, close to the township of Grewelthorpe, there was a small area, the hamlet of Nutwith, which was very important, there was a dispute in 1290 over taxes to be paid in respect of property there. Part of the area was granted to Fountains Abbey, but the Mowbray family claimed income as part of their Kirbyshire estate and so did the Earl of Richmond’s bailiff, who believed it was part of Mashamshire. Take the road from Grewelthorpe to Masham and you will come to the open space of Roomer Common. The woodland to the South was once part of this common, and it was known as Nutwith Common. This was always part of the North Riding and contains the property known as Nutwith Cote. On the other hand Nutwith Lane, sometimes called Ilton Lane, runs out of the village and this has been in the West Riding for many centuries. This cuts through the Fountains Abbey estate of Nutwith which was the centre of the dispute in 1290. The Fountains land known as Nutwith was separated from the land of the Fountains grange of Bramley by the valley known as Hutts Gill. It is thought that Nutwith was a wooded area which was eventually cleared and given to Fountains Abbey. The monks let the land off to tenant farmers. These farmers lived in scattered farms rather than the nucleated village of Grewelthorpe. It is not known when Nutwith lost its independent status, but it was part of Grewelthorpe when the Tithe Commutation Act took effect in mid 19th century. In contrast to Bramley which retained its tithe free status. 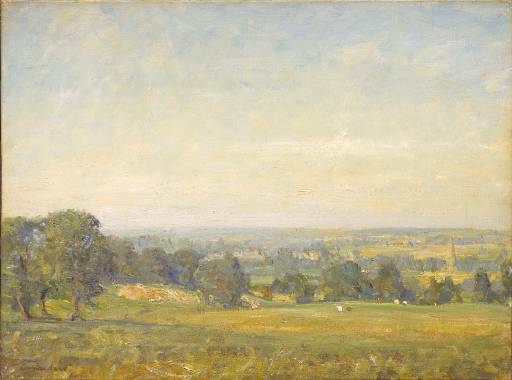 Nutwith Common, painting by R.Brundrit 1883-1960 in Tate Gallery. 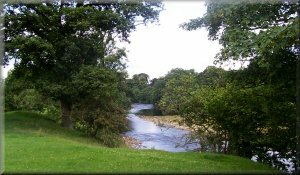 River Ure at Nutwith Cote.